A group of former European Union diplomats in a letter to EU’s foreign policy chief, Federica Mogherini has questioned EU’s blind support for the Zionist entity. Copies of the letter were sent to US foreign secretary John (Cohen) Kerry, Martin Schultz (Jewish) president of European Parliament, Donald Tusk (Polish Israeli lobbyist), president European Council and Jean-Claude Juncker (Jewish ancestry), president of European Commission. The group known as the European Eminent Persons Group, has urged a reassessment of EU policy on the question of a Palestinian state and has insisted the Zionist regime must be held to account for its actions in the occupied territories. By calling the 22% land “occupied” by the Jewish army in June 1967 – the signatories of the letter are trying to legalize the 1948 occupation of historic Palestine by European Jewish terrorists. It charges that EU political and financial aid has achieved nothing but the “preservation of the Israeli occupation of the West Bank and imprisonment of Gaza.” Israel receives the highest EU aid among the non-member countries in the world. It has also raised the doubts that the US administration under pressure from pro-Israel Jewish lobby groups, cannot play the role of an unbiased negotiator between Israel and Palestinian leadership. It also argues that the re-election of prime minister Binyamin Netanyahu at the head of anti-Arab extremist unity government has made the issue even more pressing. Netanyahu has appointed pro-illegal Jewish settlements campaigner Ayelet Shaked his Justice Minister. She called Turkish president Recep Tiyyap Erdogan, Hitler. She also compared Palestinian babies with little snakes. Netanyahu chose warmongering Rabbi Eli Dahan as his deputy defense minister. 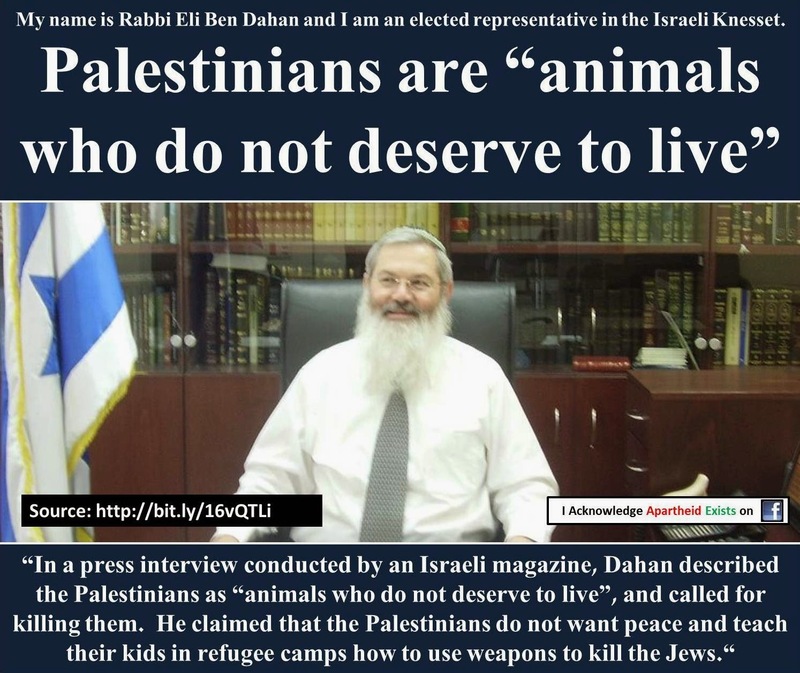 Dahan has the Talmudic qualification to exterminate the entire native Palestinian population – as they’re not humans. In case, the EU likes to be remembered by the future historians as an ‘honest broke’ – it should play its necessary part in putting the Zionist regime on notice that unless it ends its defiance of international law and becomes serious about peace on terms the Palestinians could accept, it will be isolated and subjected to sanctions of the kind that played a major role in pushing South Africa’s apartheid regime to its end.